The WPF Controls 2017.1 build 651 maintenance release is now available. This build has a large number of updates and new features for various WPF control products (Docking/MDI, Editors, Grids, Ribbon, SyntaxEditor, Shared Library), and includes bug fixes for all issues that have been found since the original 2017.1 release. 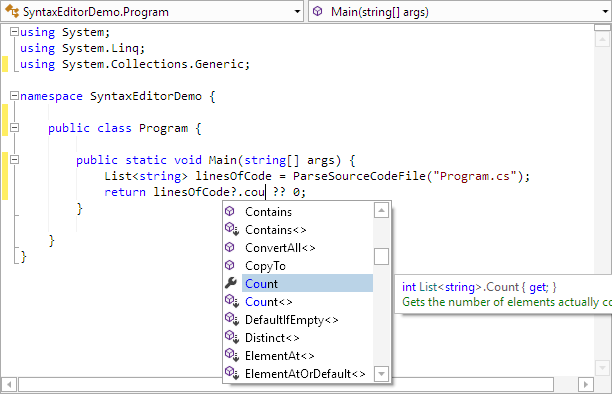 In addition, the SyntaxEditor .NET Languages Add-on now supports C# 6 and VB 14 syntax, with full automated IntelliPrompt. The screenshot below shows automated IntelliPrompt working properly with a null-conditional operator. The rather large list of full update details are contained in this forum thread.